Location: Air and Space Museum, Le Bourget, France 2015; Deutches Museum, Munich, Germany, 2013. 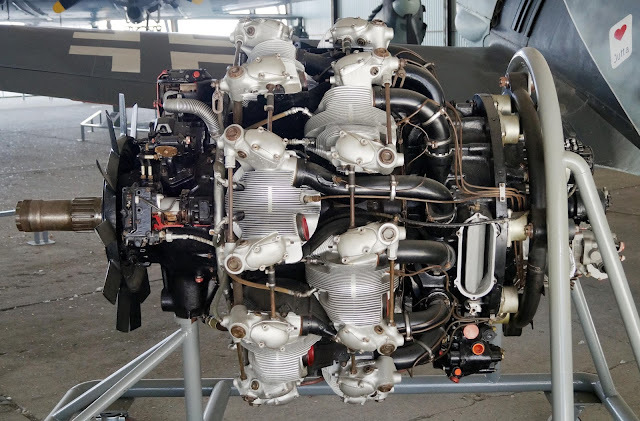 Comments:The BMW 801 was a powerful German air-cooled 14-cylinder-radial aircraft engine built by BMW and used in a number of German Luftwaffe aircraft of World War II. Production versions of the twin-row engine generated between 1,560 and 2,000 PS (1,540-1,970 hp, or 1,150-1,470 kW). 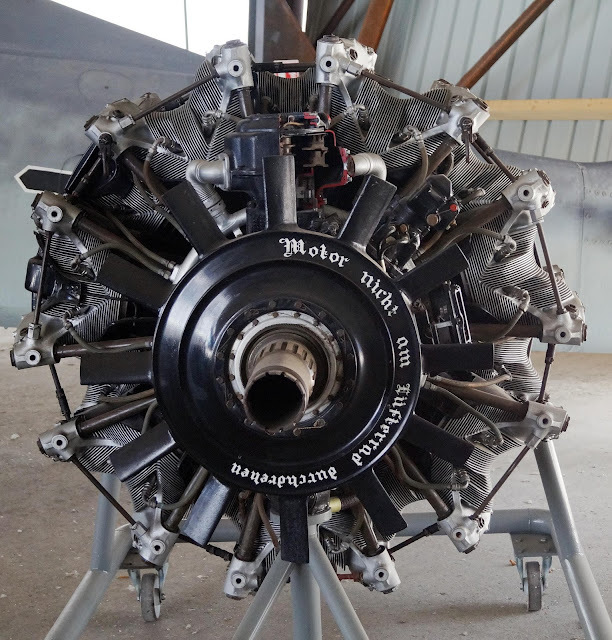 It was the most produced radial engine of Germany in World War II with more than 28,000 built. 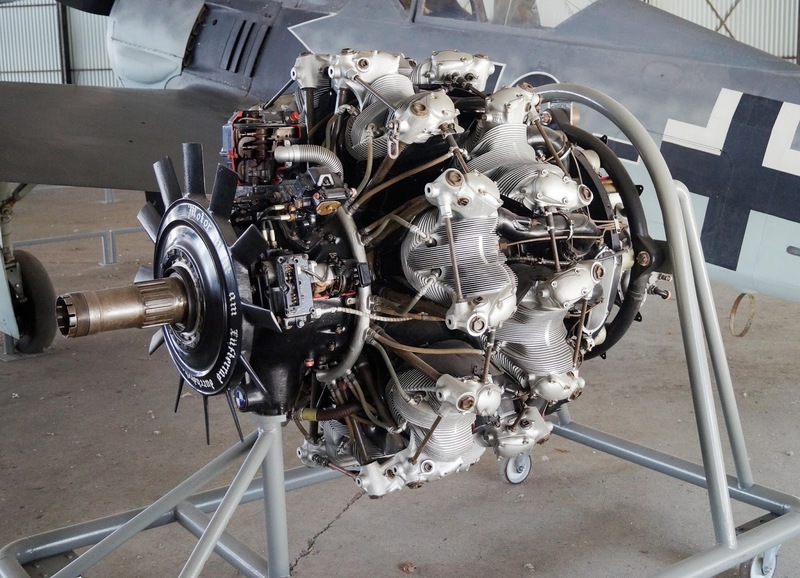 The 801 was originally intended to replace existing radial types in German transport and utility aircraft. 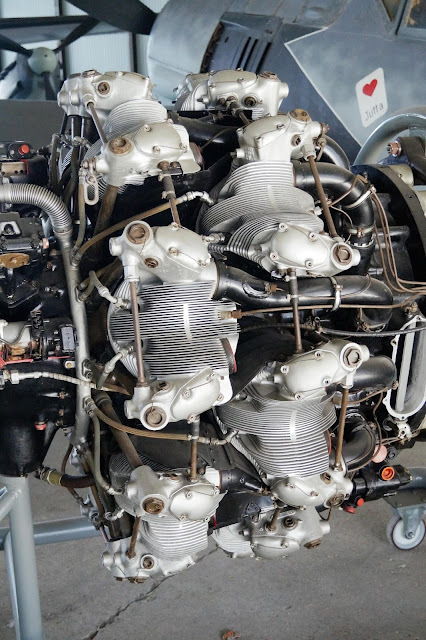 At the time, it was widely agreed among European designers that an inline engine was a requirement for high performance designs due to its smaller frontal area and resulting lower drag. Kurt Tank successfully fitted a BMW 801 to a new fighter design he was working on, and as a result the 801 became best known as the power plant for the famous Focke-Wulf Fw 190.The 801 was a radial engine with two rows of seven cylinders.The cylinders had both bore and stroke of 156 millimetres (6.1 in), giving a total capacity of 41.8 litres (2,550 cu in), just a bit less than the American Wright Cyclone 14 twin-row radial of some 1,600 to 1,900 hp output. 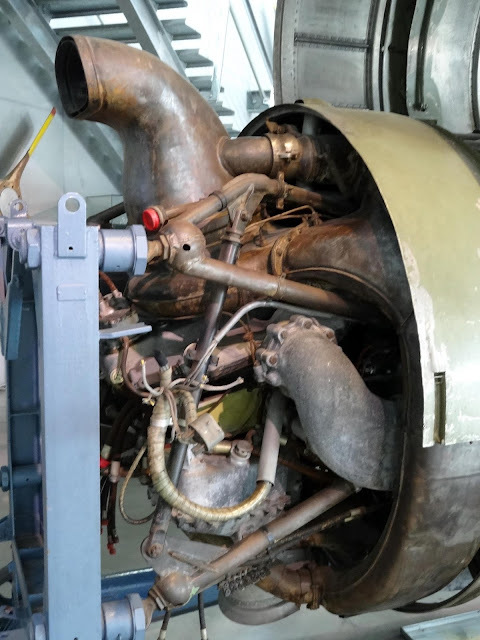 The unit (including mounts) weighed from 1,010 to 1,250 kg and was about 1.29 m (51 in) across, depending on the model.The BMW 801 was cooled by forced air from a magnesium alloy cooling fan, 10 bladed in the initial models, but 12 bladed in most engines. 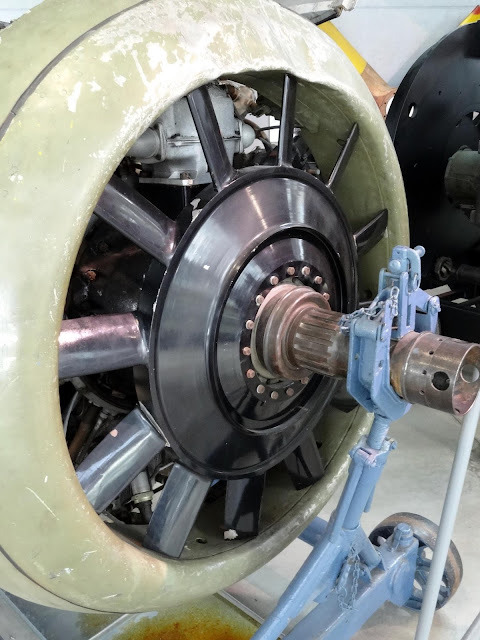 The fan rotated at 1.72 times the crankshaft speed (3.17 times the propeller speed). 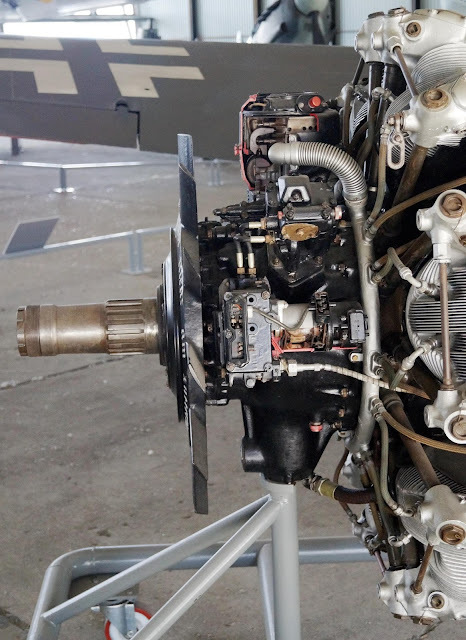 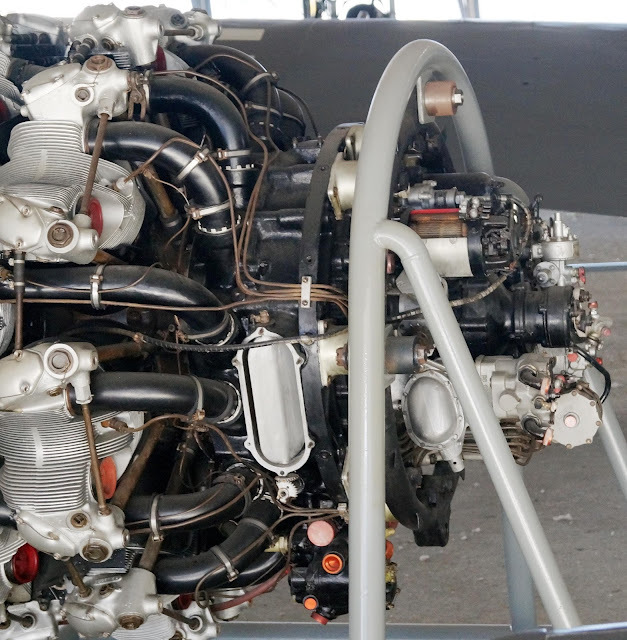 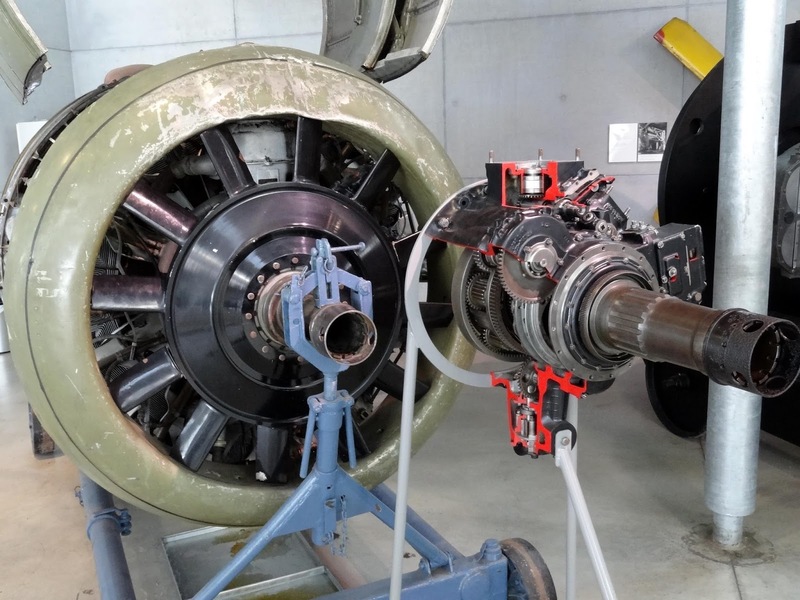 Air from the fan was blown into the center of the engine in front of the propeller gearing housing, and the shape of the housing and the engine itself carried the air to the outside of the cowling and across the cylinders. A set of slots or gills at the rear of the cowling allowed the hot air to escape. 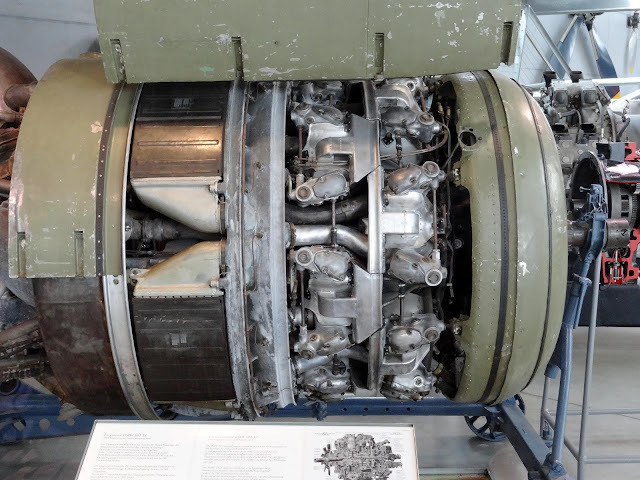 This provided effective cooling although at the cost of about 70 PS (69 hp, 51.5 kW) required to drive the fan when the aircraft was at low speed. Above 170 miles per hour (270 km/h), the fan absorbed little power directly as the vacuum effect of the airflow past the air exits provided the needed flow.